You are here: Home / Book / Why Chapters Plum Points Are Disappearing? I’m disappointed to discover that I no longer have the Chapters plum points I earned when I bought “Grammar Girl’s Quick and Dirty Tips for Better Writing” in the store a year ago. I bought it as a birthday present for myself. I have 750 points then it went down to nothing. Zilch. Nada. All I remember is that I didn’t buy anything or I may have forgotten to use my Chapters plum rewards card so I delved into the FAQ and was stunned to face the fact. If your plum rewards account is inactive for 12 months, all accumulated plum points will be forfeited. Your plum points will also become void if you cancel your account or switch to our irewards program. Because of that experience, I’ll check Chapters before buying books online from now on. Though I’m not fond of collecting points, I noted the day I bought the book. If I can get points in buying items on sale that would be great; otherwise, I am content on getting discount on quality items. To collect points, first you have to sign up in Chapters plum rewards for free either online or in store. I signed up online and claimed the card in the store. 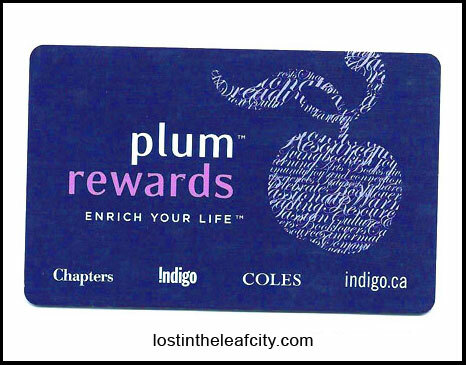 Chapters plum points are collected by buying in-store at any Indigo, Chapters, Coles, Indigospirit, World’s Biggest Bookstore, SmithBooks and The Book Company locations. Some of the items and services will not earn you points such as but not limited to electronics, Starbucks/Indigo Café Food & Beverages, irewards memberships, eBooks, and gift cards. Stay up to date with the changes. Online purchases cannot earn you Chapters plum points. On the other hand you can avail the 5% off on books as a plum rewards member. Plum bonus points are rewarded occasionally in buying books online. The best strategy in using the Chapters plum rewards membership is to buy whenever the book is on sale. Wait for the highest discount. I waited to avail the 45% off on Quiet. As of now it’s only 24% so it pays to be patient and vigilant. Whether you purchase online or in the store make sure you get the best deal and points whenever possible. Don’t forget to choose free shipping to store if you have time. I’ll make sure not to lose my Chapters plum points ever again. The experience adds up to my knowledge of buying books online with the best deal. I usually buy used books but there are times when the difference is too small that buying brand new is justifiable (it is especially for my favorite authors). In this case, I’ll definitely use my plum rewards card. I randomly read some of the chapters of Quiet and decided that I have to have it. I’ve watched the TED Talk of Susan Cain several times and even included it in my inspiring TED Talks. Finally, I can read the whole book. If you reached this far, then you know that I recommend Quiet for your next read whether you are introvert or not. Didn’t I mention it’s a great gift. Have you bought anything in Chapters lately? How much points have you collected? If the last transaction is beyond 12 months then I’m sorry to say that you have probably lost your plum points. You may log in to check your balance. But this shouldn’t discourage us in collecting points again. This time we know better.